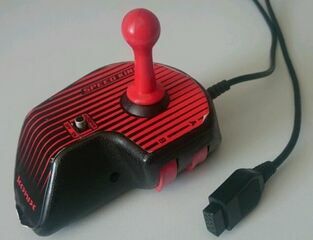 The Speedking is a joystick released by Konix which is compatible with the Sega Master System. It was also repackaged and released as the 500XJ by Epyx. Both controllers are identical, bar the slightly different branding. The Speedking was developed for high performance gameplay though is a little awkward to hold. The left hand grips the undeneath of the unit and makes use of the fire buttons, while the right is used to control the joystick. There are no obvious improvements over a regular Master System control pad. Variations of the unit were released for home computers and other consoles, including the Nintendo Entertainment System.